Drummer Hal Blaine attends an awards ceremony in Anaheim, Calif., in 2014. 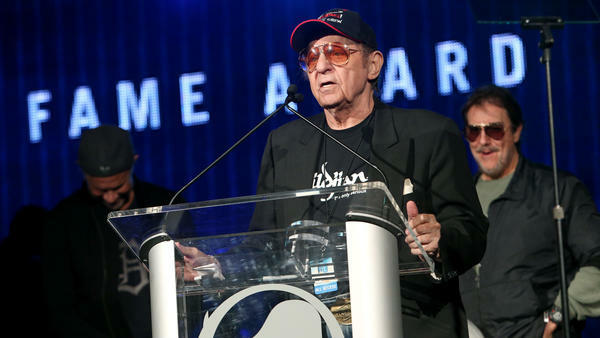 Hal Blaine, the studio drummer who lent his signature sounds and structure to scores of Grammy-winning and chart-topping songs — from Frank Sinatra and Dean Martin to the Byrds and the Beach Boys — died Monday at the age of 90. Blaine's family announced his death in a statement published to Facebook. He was an "inspiration to countless friends, fans and musicians," the statement says, adding: "May he rest forever on 2 and 4" — a reference to accent beats in a 4/4 pop song. As a session musician, the drummer came to be associated with the Wrecking Crew, a loose collective of Los Angeles-based artists who backed a host of hit makers from the 1960s and '70s. Blaine plays on "A Taste of Honey," the Grammys' 1965 record of the year, by Herb Alpert and the Tijuana Brass. "Strangers in the Night," Frank Sinatra's 1966 Grammy winner; the 5th Dimension's "Up, Up and Away," which won the Grammy the year after that ... in fact, Blaine's beat can be heard on six consecutive Record of the Year winners, up through Simon & Garfunkel's "Bridge over Troubled Water." During that era, he also lent his drums to the Beach Boys' Pet Sounds and opened the Ronettes' early '60s anthem, "Be My Baby," with the confident kicks and snare that are as familiar now on the dance floor as they are in the movie theater. As confident as that opening salvo sounded, Blaine said it was born of a misstep. "As I recall, we rehearsed it with a regular backbeat on 2 and 4. But then when we did the first take, I dropped my stick and missed the 2," he said once, in a quote attributed to him by the Percussive Arts Society, which inducted him into its Hall of Fame in 2012. "So being the faker than I am, I just played the 4, and one of the things you learn is that when you make a mistake, if you do it every four bars it becomes part of the song." You'd be hard-pressed to name a hit song from the late '60s that did not feature Blaine or his fellow Wrecking Crew members, whose informal moniker adorned the cover of Blaine's 1990 memoir. "In the late '50s, we started playing rock 'n' roll," Blaine recalled in a 2001 interview on WHYY's Fresh Air. "A lot of people said it was a dirty word. They didn't want to hear that kind of music. They thought the musicians were just rank amateurs. They had no idea that we were all well-learned and studied musicians with degrees and so forth playing music. "And the old-timers, the guys that we kind of replaced, used to say these kids are going to wreck the business," he continued. "And I just automatically started calling us the Wrecking Crew." When musicians would give him a call and ask him to round up his crew for a studio session, "I'd say, 'OK, the Wrecking Crew, here we go. And I'd make calls.' "
Both with the Wrecking Crew and on his own, Blaine became an integral pillar of producer Phil Spector's Wall of Sound and contributed to thousands of tracks that bear other artists' names. But the drummer did get his due, winning the Lifetime Achievement Award at last year's Grammy Awards and earning entry to the Rock & Roll Hall of Fame in 2000 - which dubbed him the "most recorded drummer in history." The Beach Boys' Brian Wilson gave him an even more august label: "the greatest drummer ever." "I'm so sad, I don't know what to say," Wilson tweeted Monday. "Hal Blaine was such a great musician and friend that I can't put it into words. Hal taught me a lot, and he had so much to do with our success." Ultimately though, in the studio, it was simpler than all of that for Blaine. "I just played what I felt and they let me play. You know, once you kind of make a name for yourself, then when producers would come in they would say, 'Oh Hal, just do your thing, you know, don't worry about it — just whatever you feel,' " he said in 2001. "They felt that I would always do the right thing." Drummer Hal Blaine died yesterday at the age of 90. Blaine helped shape the sound of American music in the 1960s. He was part of the Wrecking Crew, a loose collective of Los Angeles session musicians. Blaine's drumming can be heard on more than 100 top ten hits from Sam Cooke to The Beach Boys. NPR's Andrew Limbong has this remembrance. LIMBONG: ...When he opened The Ronettes' "Be My Baby." THE RONETTES: (Singing) The night we met, I knew I needed you so. SONNY AND CHER: (Singing) I got you, babe. LIMBONG: ...Simon & Garfunkel, Frank and Nancy Sinatra, The Crystals. LIMBONG: Hal Blaine was prolific and versatile. He was born in 1929 in Holyoke, Mass. As a kid, he grew up watching the drummers for his favorite big bands. After a stint in the Army, he cut his teeth drumming in strip clubs after school. HAL BLAINE: You get all these new women coming and dancing, throwing this music at you, and you got to read it immediately. LIMBONG: In a 2008 documentary about the legendary session musicians called "The Wrecking Crew," Blaine talked about how the experience was great training for sight reading. BLAINE: To this day, I can sit down, you can throw any kind of music in front of me, and I will - you know, it might be the hardest thing in the world, but I'll be completely relaxed through it, and nobody will know that inside I'm saying, holy cow, this is really something. LIMBONG: Session musicians never get the same kind of recognition that comes with actually being in a band like The Beach Boys. But Hal Blaine told WHYY's Fresh Air in 2001 that he didn't mind. BLAINE: Not at all because I knew what it was leading to because my phone started ringing off the hook with - from Phil Spector dates and Beach Boys dates. All of a sudden, I was getting calls for Elvis Presley and Mamas & The Papas. I mean, everybody came out of the woodwork. THE MAMAS AND THE PAPAS: (Singing) All the leaves are brown, all the leaves are brown, and the sky is gray, and the sky is gray. LIMBONG: Hal Blaine was eventually recognized. He was inducted into the Rock & Roll Hall of Fame in 2000 and awarded a Lifetime Achievement Grammy last year. Andrew Limbong, NPR News. (SOUNDBITE OF THE MAMAS AND THE PAPAS SONG, "CALIFORNIA DREAMING") Transcript provided by NPR, Copyright NPR.